Well hello there, pumpkin! Miss me? As a wise man once said – Thoreau, in this case – sometimes you just need to be quiet. It isn’t necessarily the sign of pain or anguish or turmoil. It certainly wasn’t in this case. I just needed…a break. Between all that has been going on with The Big C, trying to get through the ups and downs of freelance life, and trying to wrap my head around some personal issues in my life…there just wasn’t room in my little walnut-sized brain for a whole lot more. On the upside, I have been running like a fiend and training for my next half-marathon next month. I’m inspired about work and blogging again. Oh yeah, I have a little sweetness in my life for the first time in a long while – and I ain’t just talking about what you see in this post. All of that having been said, I didn’t expect to be away this long – over a month?!? Will you ever forgive me? Since I had to bring something seriously yummy and delicious to sweeten the deal on my first post back, I thought these cupcakes might do the trick. We’re in the beautiful beginnings of fall here in Atlanta…and it feels good to be cooking and baking with some autumn flavors. As much as I may hate to admit it, the base of these cupcakes are from a Martha Stewart recipe – is there anything this woman can’t do, dammit? I adjusted the spices a bit as I made my mixture – I definitely felt like the pumpkin pie-inspired spices could have been amped up. I suggest you taste as you go and don’t be afraid to add more. Top these babies with your favorite cream cheese frosting – a great recipe can be found here at Simply Recipes. Pumpkin Cupcakes with Cream Cheese Frosting – makes 18 – recipe originally found here. powder, salt, cinnamon, ginger, nutmeg, and allspice; set aside. needed. Transfer to a wire rack; let cool completely. mmm delicious, welcome back. I may try these this weekend! I’m making these today.. Welcome back. Welcome back! Mail me one, would ya? Please! Nice to see you back Tami. I’ve spent the past week discussing Thoreau with a visting friend. Now I’m in the mood to reread Walden. Welcome back, Tammi! Hang in there; hope your dad is feeling better these days. I don’t bake. At all. But I just may try this recipe of yours. Loooove pumpkin cupcakes! Welcome back and glad to have found you (through tastespotting). I was going through looking for pumpkin recipes and there was this deliciousness!! Consider it added to the recipe file. 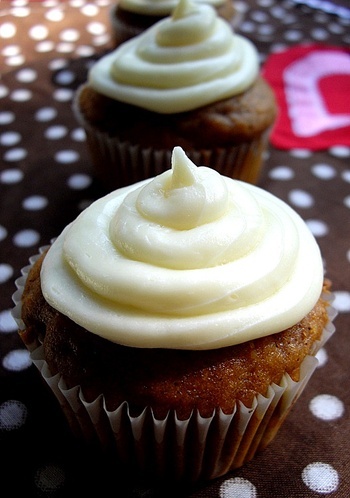 I like the addition of cream cheese frosting to these pumpkin cupcakes. Ordinarily this frosting is served with carrot but I think this makes a great combination as well. The cupcakes look awesome. I love pumpkin. We are all about the pumpkin at our restaurant right now!! The cream cheese frosting on top of a pumpkin muffin — delicious! I’m just catching up with my reading, but I’m glad you’re back too. Welcome back. Those are mighty fine cupcakes. The swirls on top are just perfect. I didn’t make these way back when… but I did today. Yours may be much cuter (they are) but mine are very delicious. I made these without the frosting…passed them off as muffins. Delicious!